Open/Close Menu Excellence. Every Time. Every Client. 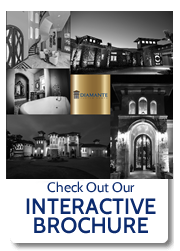 What makes Diamante Custom Homes different? Diamante Energy Star Certified new homes achieve their energy savings through a variety of reliable and established technologies and building practices. What is specifically done to our homes to make them Energy Star Certified? Green building is accomplished by increasing the energy efficiency of a home through Tighter Air Ducts, Cutting Edge Insulation, Higher Performance Windows, and Energy Efficient Heating & Cooling Equipment. Our Energy Star Certified homes feature tighter construction than that of homes built even just a few years ago. Tighter house construction can improve the energy efficiency, air quality, longer lasting HVAC systems, and overall comfort of your home by eliminating unwanted drafts. Why buy a Diamante Custom Homes Energy Star Certified home? We are able to offer you increased value through lowering your utility bills and maintenance costs, better comfort, durability & quality, and a better indoor environment. We ensure this by increasing inspections and quality assurance. Improved comfort – reducing drafts, noise, and moisture. Improved indoor air quality – keeping dust, pollen, car exhaust, and insects out of the home. Lower costs – reduces escape of conditioned air. To understand “Intelligent Efficiency” is to stop thinking about energy efficiency simply in terms of individual components (e.g., furnaces, air conditioners, insulation, or windows) and to start thinking about it in terms of the total systems approach. When engineering our Diamante Custom Homes we work with a team of engineers to utilize a “total systems approach” which considers geographic location, windows, doors, HVAC engineering and hardware, insulation package, air filtration and more. We take the guesswork out of optimizing the HVAC performance of any home or building while incorporating all the other inherent benefits of building the ultra energy efficient way. This final piece to the puzzle adds unprecedented value and consequently this efficient installation of a major component of the building system truly separates us from our peers in the industry! At Diamante Custom Homes, we have structured the Design/Build process around our clients. We Design and Build the home of your dreams with today’s cutting edge technology, energy efficiency, and a streamlined methodology that compares to no other home builder in San Antonio. © 2018 Diamante Custom Homes. All right reserved.